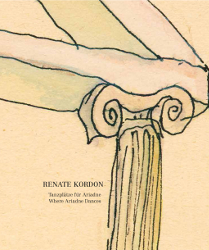 Where Ariadne Dances is the title of a series of watercolors, in which Renate Kordon develops her versions of the myth of the Cretan labyrinth. She combines elements of ancient architecture with the theme of the female artist, movement in dance, the interplay of memory and oblivion, of being with oneself and being beside oneself. Architecture is set in motion, is transformed by the artist's hand, corresponds with her, becomes light and malleable and develops sensuous talents. Renate Kordon created these watercolors in the early 1980s. This publication is the first to document the series in its entirety; contributions by Kate Howlett-Jones and Otto Kapfinger and a conversation with Diane Shooman provide interpretations from various perspectives. Renate Kordon, born in 1952 in Graz, lives in Vienna. She studied architecture and later graphic design under Oswald Oberhuber and animation under Maria Lassnig. With unpredictable degrees of irony, experimentation, and spiritual seriousnes, she works in various media: drawings, animated film, and installations. She is the co-founder of ASIFA AUSTRIA and the founder of the TIME-Shift-Institute in Graz.